Damage from a house fire on Wamsley Way in Rifle Thursday that dispaced a family temporarily. A house fire in Rifle on Thursday will leave one family without a home for the time being, as Colorado-Wyoming Red Cross assisted in finding them temporary housing in Rifle. 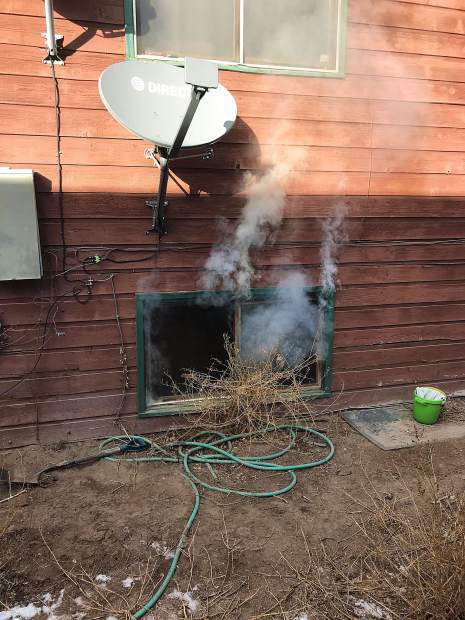 Though firefighters contained the blaze in the 900 block of Wamsley Way to one bedroom, heavy smoke damage will require significant repairs, according to Colorado River Fire Rescue Public Information Officer Mira Pina. She believed the family would be able to move back in after repairs. The family includes one adult, three children and two cats. One cat died in the fire. There were no reported injuries or hospital transports. Pina said the fire is still under investigation. Red Cross helped with the family on scene. Colorado Wyoming Red Cross Public Information Officer Bill Fortune said that Red Cross provides displaced families with “direct client assistance,” providing them with money for a few nights at a hotel if they have no place to go. He said the organization averages at least two fire calls a day throughout Colorado from families in need of assistance. Fortune added that, because of colder temperatures, there has been a slight uptick in house fires in Colorado this winter. He advised folks to be careful with fireplaces, stoves, heaters, etc. During the winter months, Pina suggested that anyone using a space heater should keep items that can burn at least three feet away at all times. Same goes for fireplaces and woodstoves. She added that heaters should be plugged directly into a wall outlet rather than an extension cord. “Don’t ever leave your house with the heater on,” she concluded.